You go for a walk in the woods, return home, and later notice a tiny new bump behind your ear. A closer look reveals the bump to be a passenger from the forest. You have a tick. Now what? The first step is to remove that sucker with tweezers, said University Distinguished Professor of Biology Kim Lewis, who directs Northeastern's Antimicrobial Discovery Center. Next, you'll need to identify what kind of tick you're dealing with. The most common types are deer ticks, which are small with reddish-orange coloring, and dog ticks, which are brownish-beige and fairly large. 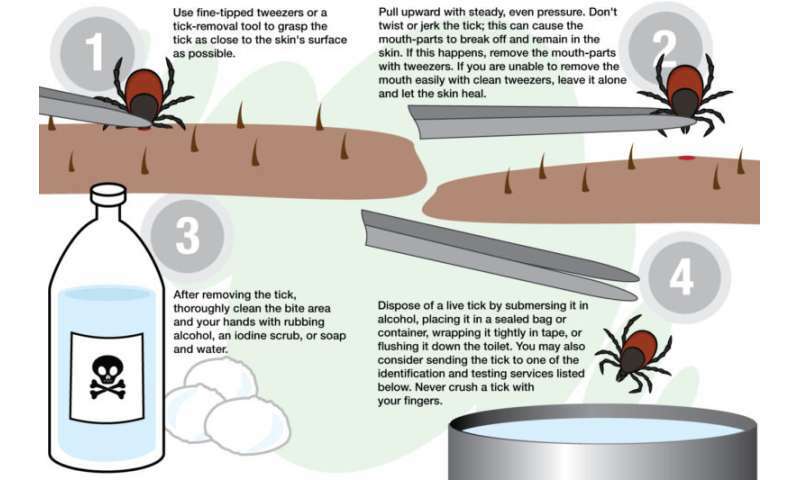 Deer ticks carry Lyme disease and other illnesses. If you determine that you've been bitten by one, you'll want to put it in a plastic bag and show it to your doctor, who may prescribe you an antibiotic. You may also consider sending the tick to an identification and testing service, which will charge at least $50.